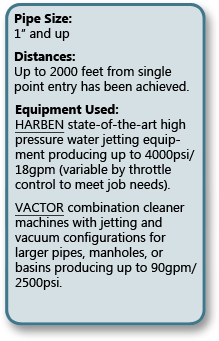 Proper high-pressure water-jetting for pipe & drain cleaning requires the right equipment for the particular application, combined with operator expertise in nozzle selection and the intelligent use of the equipment. 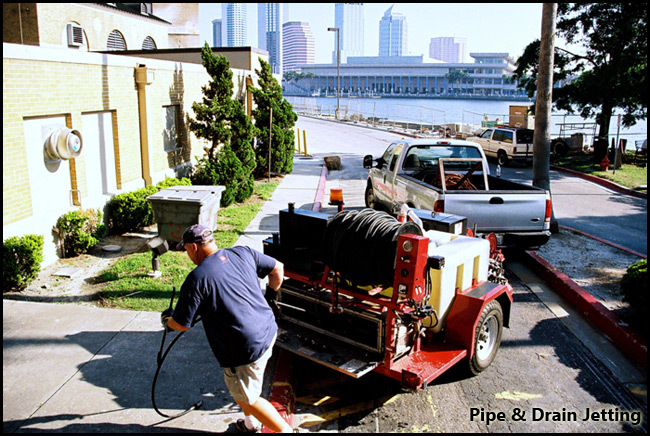 Pipes & drains requiring cleaning include sanitary sewer pipes/main sewers, services, roof drains, floor drains, vent stacks, storm sewers, industrial piping, conduits, and condensate discharge piping. Substances to be removed include grease, sand, debris, roots, asphalt, lime, calcium, barnacles, etc. 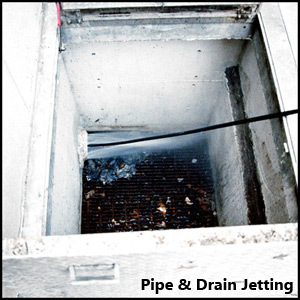 A vital point in drain cleaning using high-pressure water, often misunderstood, is the necessity to jet upstream against the flow and then pull back with the flow to properly scour the pipe walls and then evacuate the debris from the pipe. It is only in this way that the material is properly removed from the pipes. When the plumbing configuration does not allow access to clean laterals/services in this way, then routine procedures involving stringing the line can be employed or an access can be cut into the line. There is always a way.